Assign/rename/delete name for optional Hard Drive partition. 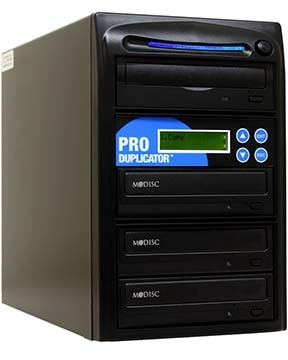 Able to load master disc automatically into the Hard Drive and copy directly from the loaded Hard Drive if a hard drive is installed. Error detection features: test and copy, copy and compare. User friendly 'easy-to-read' LCD display, no training is necessary. Upgradable for future drive technology. Continuous copying without waiting for cool down. Auto DVD Format Conversion converts media between DVD+R/RW and DVD-R/RW automatically.